THE FOLLOWING WAS WRITTEN IN JULY, 2008. How photography has changed now! "By combining two exposures - one for the night sky and the other for the landscape at twilight, I was able to create this image. I consider it among my most unique images to date. 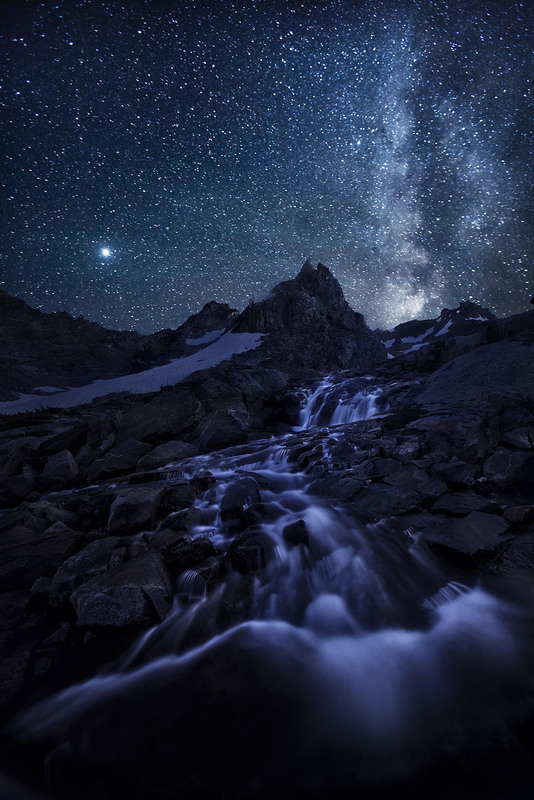 What you are looking at is a remote backcountry in the Tetons and the milky way above. My exposure for the sky takes in more than five times as much light as is discernable to the naked eye, using an extremely high ISO (combined with noise reduction techniques), a big aperture of f/2.8 and keeping the shutter open for 45 seconds. The sky is totally natural in color despite being relatively invisible to us. The glow behind the peaks comes from the moon that set almost an hour before this capture. The bright spot at left is a planet. This shot is a culmination of technical advancements in photography and a great deal of diligence on my own part in the field, figuring out how to put it all together. I camped at this location three nights to achieve this result". Photo © copyright by Marc Adamus.